Ok. So we talked about what Sponsors SHOULD do. Now we need to talk about what YOU should look for when you’re ready to pay someone cold, hard cash to promote your blog! First things first… Ask Around! The bloggers you know, will know! Ask on twitter or Facebook. Fire off a couple emails asking for recommendations. Happy bloggers will gush and tell you everything you want to know. Unhappy bloggers will tell you more than you need to know. Either way, you’ll know where to start looking. What are they offering? – Typically you’re going to find options ranging from just ad space all the way up to weekly guest post options, and everything in between. Most offer Facebook mentions, Tweets and shout outs as well. What are their stats? – Some bloggers have their stats right on their sponsor/advertise page. Some have no information at all. If you’re willing to do your homework and a little snooping, you can get a rough idea of what type numbers they have, but you won’t be able to find out the page views. Page views is the number you want to look at. Anyone can have a huge “following”, but does that following translate into page views, comments and interactions? What type of interactions do they have/do they do? – Do they get lots of comments on their posts? Do they tweet/respond to tweets? What do they post on their Facebook page? Do people respond to them? Ask for referrals – Near the end of the month ask the people who are currently on their side bar how things went. Were they satisfied? Did they get everything promised? Did they see results? This is probably the HARDEST part, but in the end its going to be worth it. It gives you a chance to see how they promote the blogs they’re working with. Pay attention to the details. How do they run giveaways? What do they tweet for their sponsors? Do they do the things they promise for their other sponsors? have their sponsor links. I also look at what they do with their sponsorship. ” 1 I have the Alexa Toolbar installed, I use it to tell me how the site ranks on Alexa. 2 Forget followers, look for page views. 3 What is included in the ad package? to their sponsors to see of they would recommend that I sponsor that persons blog. “When I am looking for a blog to sponsor I look for someone with great interaction. a consistency in their readership. Loyal commenters daily tell you a lot about a blog. their numbers. Check and see what they offer to sponsors and if they actually DO IT. won’t remember who I am the next day. So there you have it! Basically it all boils down to doing your home work. It might seem like a lot of work. In fact, it kind of is a lot of work, but if you want to get the best results and avoid disappointment, than it is a worth while investment of your time! What do you look for when you want to sponsor someone? Awesome post and series!!! 🙂 You rock girl!! This was GREAT info! I read your other post and well and I am excited to become more involved in attracting Sponsors. Just curious, I have a small-ish blog following but big FB following and when I compare monthly page views to some other blogs, I've got more than they have. You mentioned $5 and $15 for lower followers, at what point would you ask for more? I'm just trying to price myself accordingly. Thanks so much! Great advice! I agree – and I think it SO important to invest your money wisely. That is, fork over the big bucks for someone who has a much larger and broader follower base than yourself, instead of spending the same amount on several different blogs that have about the same numbers as each other and yourself. I also check to see if I know the buttons on their sidebar. If I know 'em all, chances are we're all in the same circles. If there are several new to me blogs or shops – that's a good sign that their readership extends a good ways outside of my current circle of influence. Thanks for the post, Jennifer! I haven't gotten there yet. I'm still working on building my site and my name, then I'll work on sponsoring someone, but these are awesome points to remember before doing so! Wow, such great info! 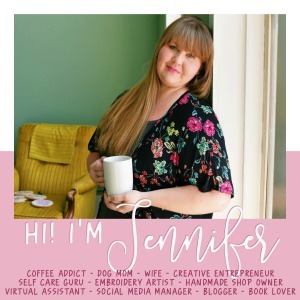 I'm pinning and sharing with the Bloggy Girls FB Group (https://www.facebook.com/groups/378153525571032/). It's nice to see what others look for in bloggers! Thanks for linking up this weekend! Great info! Thanks for linking to Cowgirl Up– I think this post will be useful to a lot of people!